Cook pasta according to the instructions on the package with one table spoon of salt. Use chicken stock instead of water or use a chicken bouillon. Drain and combine with Basil Pesto. If desired serve out the plates first and then just spread the basil pesto on top. 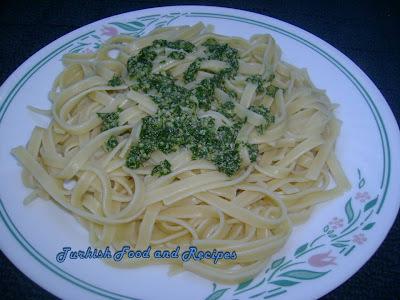 Serve Pasta with Basil Pesto warm. Makarnayi paketin uzerindeki talimatlara gore tuzlu tavuk suyunda ya da tavuk bulyonu kullanarak pisirin. Suyunu suzun. Feslegenli pesto sosunu ilave edip guzelce karistirin. Arzu ederseniz once makarnayi tabaklara alin ve uzerine feslegenli pesto sosu koyarak servis yapin.